These are one of our most popular Business Card range and one of the fastest printed. These business cards are printed on our thick, rigid 420gsm premium Sunshine Coast business card stock. The business cards are then given a gloss cello coating on the front. This gloss cello adds a layer of protection to the front of the cards. It also enhances any photos and gives a deep lustrous shine making your business cards pop. The back is left uncoated allowing you to write on the back. These business cards are also great for loyalty cards and appointment cards. Being one of our most popular business cards means that our Sunshine Coast 420gsm Business Cards production runs on this stock fill up fast, allowing fast turnaround times. 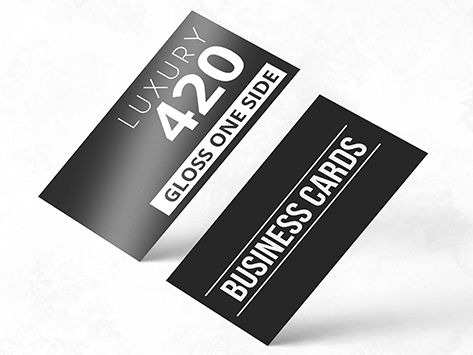 Our premium gloss cello one side 420gsm business cards are normally printed and dispatched in 24 hours to 48 hours (1 to 2 working days) if you order before 10am Monday to Friday.